Soak 1/2 cup of urad daal and 1/2 cup of channa daal together in water for 1 hour. Remove the water and let the daal dry in a clean, dry cloth or paper towel. Now, soak the 1 cup urad daal for 1 or 2 hours. Grind the urad daal with redchillies and little water. If you are going to add green chillies later, reduce the redchillies. 3 or 4 should do. Grindt to the consistency of medu vada batter. To this batter, add salt and add the dried daal mix, chopped green chillies, curry leaves and cilantro and mix well. 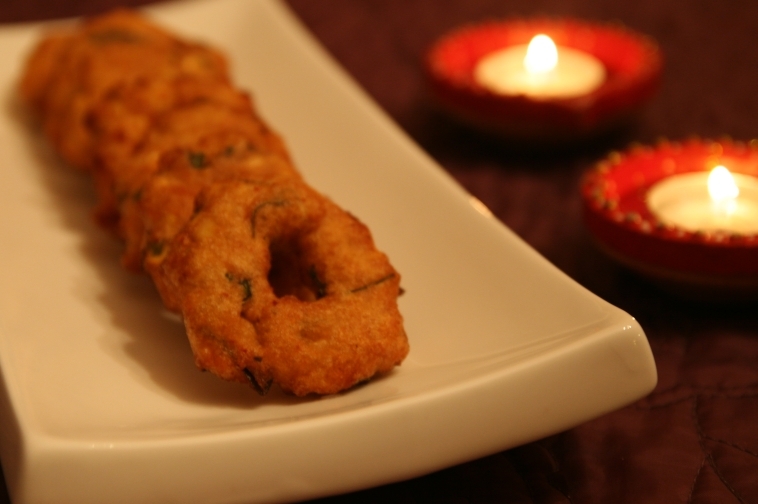 Mmmmmmm beautiful shape and yummy crispy vadas... Who don't say no to this. This is new to me...Interesting. Looks like the best of both uzhundu and paruppu vadais. perfect vadai! !nice presentation and click! Crispy vadas looks sooo tempting..
Wooow beautiful shape and tempting pic. have to try this onefor sure. Vadas look so crispy and yumm. Beautiful click! Sure looks very tempting,no one can eat just one Vibaa! A keeper recipe Vibs. Hope you had a good Thanksgiving.